As we reported earlier this week The Hunt 4 Bigfoot is considered a hoax. We have an embedded video from 9News in Silverton and another news link below from the Huffingtion Post. SILVERTON - For $250, photographers can enter to win $1 million for snapping a photo of Bigfoot in the mountains of southwest Colorado. The problem is the event's supposed sponsors and host resort have never heard of such a thing. 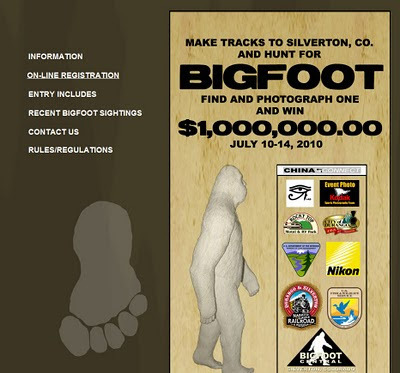 The hunt, advertised through the website www.hunt4bigfoot.com, is the brainchild of Silverton-businessman Rick Lewis. He owns Bigfoot Central, a gift shop and "museum." Lewis is also the recent target of several cease-and-desist letters from companies and government organizations that he implied were sponsors of his event. The $1,000,000 Hunt For Bigfoot offered a chance for 400 participants, for $250 apiece, to win the bounty for catching Bigfoot in a photograph during a July 10-14 event at Kendall Mountain Resort in Silverton. However, the event appears to be about as real as the mythical hairy forest-dweller itself. Silverton town administrator Jason Wells says the Kendall Mountain Resort, which is owned by the town, has never been scheduled to host the $1,000,000 Hunt For Bigfoot. Wells says the resort is booked with a different event that weekend. "I just want to make sure that we're not somehow tied into this whole affair," Wells said. "I don't want a bunch of people showing up here who have paid $250 for there to be a lack of an event that's got the town's name in any way attached to it." In a statement, dated 12/27/09, to Whalesinspace.com Rick Lewis released this statement.